Global Credit Union has demolished a drive-thru coffee stand at the intersection of Walnut Street and Fourth Avenue to make way for a three-unit retail building and new parking lot, according to permits filed with the city. Site work is underway on the southwest corner of the intersection for the $875,000 project. The work is part of a two-block plan led by the credit union, which will also bring a drive-thru coffee shop to the corner of Third Avenue and Walnut in its one-story, pyramidlike building built in 1985. Global’s five-story headquarters, built in 1979, sits in the middle of the project. The credit union purchased nearly the entire block where the new retail is being built in 2016 for $4.85 million. The sale did not include the Maplehurst apartment building facing Maple Street on the same block or the small barnlike structure to its south. The retail building will be 5,100 square feet. Nearly 70 parking spots will take up the remaining space, with most reserved for the credit union. The new coffee kiosk on Third will be 2,100 square feet. Overall, the project site will have 205 parking spots, 160 of which will be reserved for the credit union’s use. The new building was designed by Wolfe Architectural Group, of Spokane. TD&H, also of Spokane, performed the structural engineering. Permits do not list the project’s general contractor. – N.D. The company will revamp its current 108,766-square-foot building at 10412 E. Sprague Ave. to house a modern retail showroom and 835 indoor climate-controlled self-storage units with high-tech security features. The company also will add a hitch bay for professional hitch installation and a secure U-Box warehouse. U-Haul, through its corporate sustainability initiative, aims to reduce its carbon footprint with infill development. “U-Haul is applying its adaptive reuse practices to the former University City Mall and J.C. Penney property to make do-it-yourself moving products and services more accessible to Spokane Valley residents,” Manny Mendez, president of U-Haul Company of Inland Northwest, said in an email. U-Haul acquired the former Penney building in 2017. The company offers truck and trailer sharing, moving supplies, U-Box portable moving and storage containers in a temporary showroom. Mendez said self-storage units will be available early next year, and U-Box storage containers may be used temporarily until the rooms are ready. Propane also will be offered at this location in the near future. – A.E. Construction has begun on an urgent care clinic near the intersection of U.S. Highway 2 and Holland Avenue in north Spokane, according to city permit data. The $800,000 project, called MultiCare Indigo-Spokane North, is improving an existing, 5,400-square-foot building built last year. When complete, the clinic will have 10 exam rooms and additional clinic support spaces. MultiCare, a Tacoma-based company that bought the Rockwood Health System in late 2016, has 16 urgent care centers in the Puget Sound region. At its “high-end” clinics, patients receive coffee, can use Wi-Fi and mobile device charging ports and are attended by a “concierge.” Like most urgent care facilities, its clinics treat a range of conditions that typically require immediate, nonemergency care, including cold and flu, fevers, minor fractures and sprains, sports physicals and urinary tract infections. The clinic is expected to open in October. The project’s general contractor is Bouten Construction Co., of Spokane. BCRA Design, of Tacoma, is the architect. 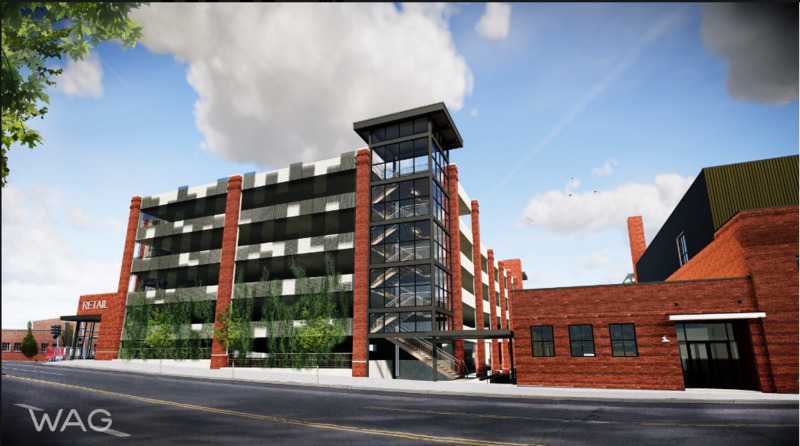 – N.D.
Construction on a parking garage for the Wonder Bread building is well underway, with the first elevated concrete pouring scheduled to take place this week, according to information from GLR Engineers. The six-level parking garage will have 250 stalls. The building will be immediately north of the historic bakery, which is undergoing a $15 million renovation to turn the bakery into a 112,000-square-foot retail space and market. The renovated space, called Wonder Spokane, and garage are on the same block as David’s Pizza near the Spokane Arena at 821 W. Mallon Ave. According to GLR, the parking structure will be built using post-tensioned concrete-slab construction supported by concrete columns and shear walls. – N.D.
Nicholas Deshais can be reached at (509) 459-5440 or nickd@spokesman.com. Contact Amy Edelen at (509) 459-5581 or amye@spokesman.com.